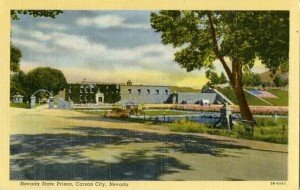 CARSON CITY, Nev. — Lawmakers Tuesday voted to reverse the governor’s budget recommendation and keep Nevada State Prison open for the next two years. That decision and others made by the joint Senate Finance/Assembly Ways and Means subcommittee put a near $30 million hole in the Department of Corrections budget — a hole Director Howard Skolnik said they will need to fill somehow. He has warned repeatedly his department’s budgets can’t be cut any further in other areas without jeopardizing the safety of inmates and his staff. Closure of NSP would actually have saved the department more than $33 million over the biennium. Lawmakers also voted against Gov. Jim Gibbons’ recommended closure of the Tonopah Conservation Camp, which will add $1.98 million to the hole. In addition, they voted to delete $5.47 million each year the governor’s budget had included as revenue form leasing Southern Nevada Correctional Center to the federal immigration service. The panel chaired by Sen. Joyce Woodhouse, D-Las Vegas, offset part of the cost by reducing the budget $4.4 million to reflect new, lower projections for how many inmates Nevada will have in prison over the next two years. They saved even more by voting to delay the opening of High Desert Prison Phase 5 — $11.2 million. In addition, the panel voted to delay the opening of Three Lakes Valley Conservation Camp two years. With Tonopah still open, the system doesn’t need the capacity and keeping it closed covers most of Tonopah’s operating costs — $1.6 million over the coming two years. When all those numbers are put together, the total lawmakers will have to find to balance the Department of Corrections budget is $27.84 million. Skolnik said he is concerned that lawmakers don’t also decide to eliminate the project to begin expanding Warm Springs prison in Carson City — which will replace NSP when that 146 year old institution is finally closed. The latest Capital Improvement Projects list includes $62 million in bonding to expand culinary and other core operations at Warm Springs — located next door to NSP — and add three new housing units. He said he is also worried about protecting the plan to build a Southern Regional Medical Center for the prison system. At present, the only medical center in the system is located in Carson City. Both of those projects are in danger because falling property tax revenues statewide may take as much as $126 million out of the $400 million in bonding capacity the CIP program is counting on. Skolnik recommended closing NSP in the first place saying it was the only way he could meet the governor’s budget targets. The move was strongly opposed by unions representing the nearly 200 people who work there. They enlisted Carson City officials as well, who argued now is not the time to put all those people out of work. Skolnik has said most of those jobs will come back as jobs at Warm Springs. But expanding that prison will take time. He said the other thing he is concerned about is the decision to eliminate an additional warden’s position he requested for High Desert. He testified that southern Nevada prison is just too large to manage properly — more than double the size of Northern Nevada Correctional Center. His proposal would divide it into two adjacent prisons by basically building a fence through the middle of High Desert. One side would be medium security and the other close custody. The committee agreed to add the two associate wardens so each prison would have two in that position. But they saved about $100,000 by eliminating the second warden, arguing one warden could still manage both institutions. The proposals were approved unanimously by both Senate and Assembly members on the subcommittee. The decisions must still be ratified by the full Senate Finance and Assembly Ways and Means committees, including finding a way to fill the hole in the corrections budget. This entry was posted in 2009, Nevada, NSP, Prison plans and tagged 2009, Nevada. Bookmark the permalink.